I find food costumes for dogs to be cute – especially for my food hound. I started out by painting the balloons to look like Jelly Belly beans. When buying the paint, I looked online and tried to match the colors to the real thing. In total, I picked out 25 Jelly Belly beans to recreate. Don’t paint your balloons too early, most will deflate after about 5-7 days. Also, once blown up, don’t expose the balloons to extreme heat or cold. I used yellow balloons for all beans with white, pink, and yellow base color; red balloons for red and orange base color beans; and blue balloons for blue, purple, black, and brown base color. For the green, I used one of each color balloon – yellow balloon for light green base color bean, red balloon to be lightly painted with just a green wash for the watermelon bean, and blue balloon for solid green bean. It took about 2-3 coats of base. The decorations on the non-solid color beans only needed one thick coat. Once dry, I did one layer of mod podge (shiny). A few helpful hints -To dry, I strung string between 2 walls in my laundry room and hung the balloons from it with binder clips. Also, be careful – no matter how long you let it dry, I’ve found mod podge (shiny) will always stick to itself so don’t let balloons touch each other until you are ready to put costume together. Finally, if you don’t mod podge, balloons will rub against each other when wearing and all paint will rub off. Next make your bag – I tried to make it with gift basket bags but they kept ripping. Instead I used a clear bag that was like a garbage bag and cut off bottom so it was open on both ends. Use one of your dog’s coats or shirts as a starter template and then just make bigger to allow for room to put balloons. Cut out leg holes and reinforce with packing tape to prevent ripping. At top and bottom of bag, hole punch all along entire edge all the way around (about an inch in) to feed your red ribbon through. When cutting ribbon, make sure to cut enough so you can make a big bow. This is how you will tie both ends of bag once you put it on. Before hole punching the holes, cut a little piece of clear packing tape and place on each side of bag, then punch hole where you out the tape – this will help reinforce the holes. The hardest part was figuring out where to cut the bag under my dog’s tummy so he could still potty. I put the bag on him (once leg holes had been cut and ribbon attached) and then marked where the bag needed to end. I then cut out an upside down u shape with the round part of my u ending where I had drawn my guide line. For logo, print copy from internet. Cut out in stiff felt and put together with fabric glue. I also printed a random nutritional info box from the internet and stuck it in the bag towards the bottom. For the hat, I cut cardboard in a hexagon shape extending each side to form sides of hat. I then taped cardboard together with packing tape and covered with non-stiff red felt using spray adhesive. I cut a hole in top of hat and threaded through a piece of the bag. Then I secured red ribbon to tie around my dog’s head both in front of and behind his ears (so 2 pieces of ribbon on each side of hat). 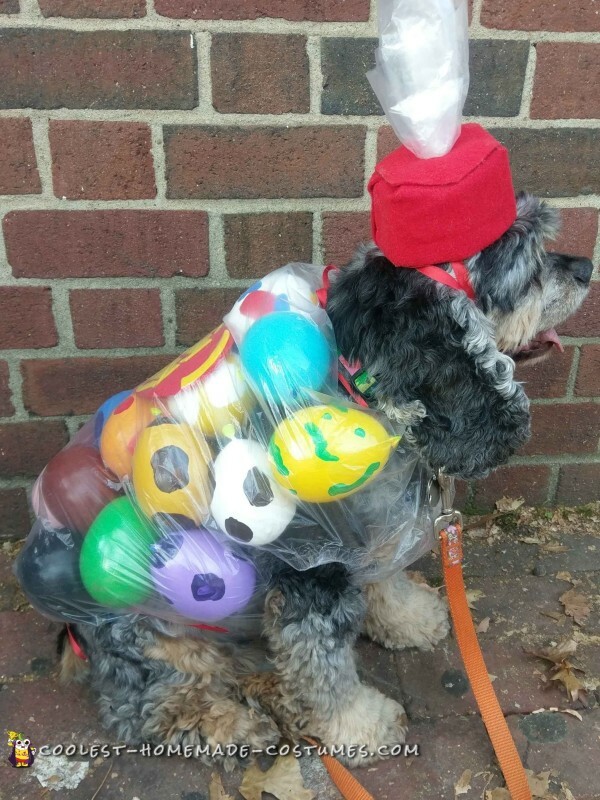 My dog is a cocker who weighs about 25lbs – it took about 25 – 30 balloons to fill his costume. It was a huge hit at the costume contest. Everyone loved it!! 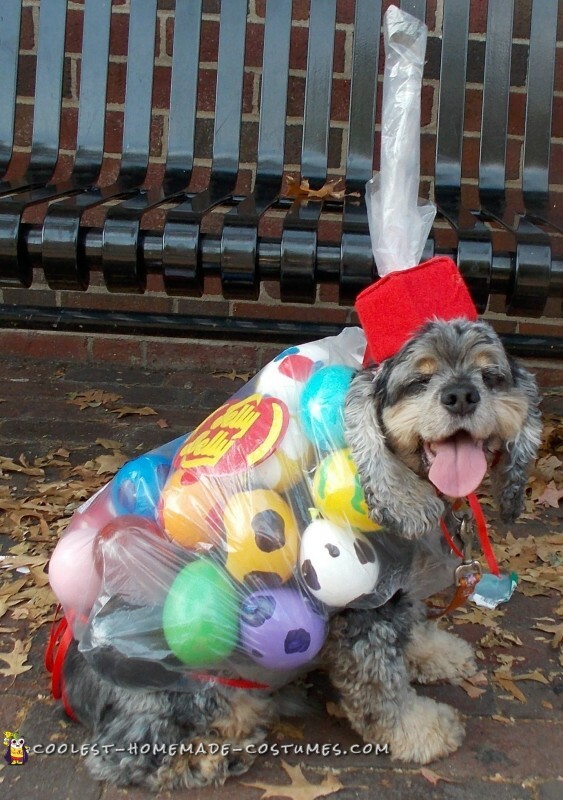 But this DIY dog costume would not work for every dog. My dog doesn’t mind dressing up normally, but even he was a bit bothered by this costume because of the noise the bag made when he walked. I recommend using this costume only for a contest where there isn’t much walking involved. Also, don’t be worried about balloons popping and scaring your pup – with all the paint, when a balloon pops it makes no noise – the air just deflates quickly.